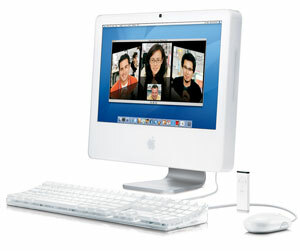 Apple iMac Core Duo is the first Intel-powered desktop PC from Apple, which previously use PowerPC G-Series CPUs from IBM. iMac Core Duo features 20-inch LCD and 2 GHz processing power. CNet concluded that If you use Photoshop or other nonnative apps, wait or look elsewhere; otherwise, Apple continues its trend of delivering better technology for the same price with its first Intel-based desktop, the iMac Core Duo. Check out more Apple iMac Core Duo reviews.